With the Arkansas Razorbacks prepping for their first preseason scrimmage on Saturday, the energy has to be high on the Hill. The Hogs have been working for a week and Saturday will be the first big opportunity for players pushing for roles on the team to make their first big statement to their position coaches and head coach Chad Morris in game-type situations. Saturday’s scrimmage will give Morris and Co. an indication of the squad’s relative strengths and weaknesses, and a baseline for moving forward. What seems to have been exposed during the first week of work is something most Hog fans suspected and maybe expected in that the offensive line is not a team strength. Depth is slim across the board and a few injuries have only made the situation worse. A summertime back issue put expected starting left tackle Colton Jackson on the shelf before practice even started. He is expected to be out until at least mid-October after surgery. Dylan Hayes, who was expected to battle for the starting center spot, has missed work because of an injury, which has unit leader and All-American candidates Hjalte Froholdt working at center rather than guard where he has started 30 games. Jalen Merrick, who was expected to push for a starting roles, has not practiced because of headaches, and squads man Deion Malone is out for the year with a knee injury. Morris has said Hayes could return as quickly as today, and that they hope to get Merrick back soon. Just having those two players back at practice would make the picture much better, but their return doesn’t ward off more injuries, especially with more scrimmages on the docket. Offensive line coach Dustin Fry is doing what he can at the position by cross training his troops, but the weakness in the offensive line was a major contributor to Bret Bielema getting fired, and it continues to cast a shadow on Morris’ regime. While the overall recruiting picture has been rosy for the Razorbacks recently, Arkansas is not exactly cashing in on commitments from offensive lineman. With Froholdt and expected starters Brian Wallace and Johnny Gibson matriculating from the program after this season, it appears the offensive line will continue to be a trouble spot for the Hogs next year as well. Considering the fact few offensive linemen step on campus ready to compete in the SEC, this is an issue Morris and Fry could be dealing with for two to three more seasons to some degree. Arkansas might be forced to look at junior colleges for help, but from history only about one out of every three JUCO recruits ever really pans out for the Razorbacks. That said, if Hayes and Merrick do return to practice relatively quickly, the cross training might benefit the Razorbacks by Fry getting more players ready for action. 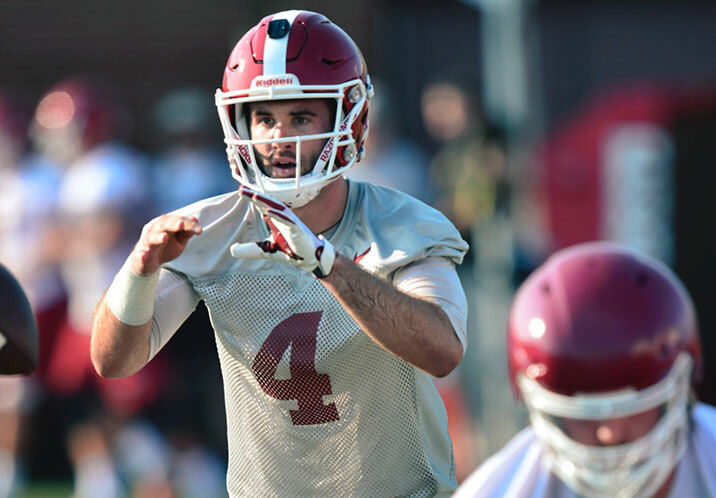 Morris said last Saturday during Razorback Media Day that the quarterback competition will continue at least through the two major scrimmages on Saturday and Aug. 18, and further if it has to. So, I wouldn’t expect Morris to name a starter coming out of this scrimmage. What would be interesting to see is a depth chart or pecking order at receiver. There is talent and depth at the position, but consistency was an issue last year, and “consistency” seems to be a buzz word for Morris and his staff. When Bobby Petrino ran his rendition of the spread at Arkansas, he deployed a truly talented group of receivers. They ran most of the SEC opponents ragged, but Alabama and LSU’s bruising safeties and linebackers intimidated them. One hopes that’s not the case under Morris, who is looking to add larger, faster, and more physical wide receivers to the Hogs’ lineup. Defensively, it seems that John Chavis will be able to put a competitive starting 11 on the field this year, but depth could be an issue. There is a concern about the amount of plays the Hogs’ defense will be on the field because of the tempo Morris’ offense plays at. It will be interesting to learn if the Hogs’ defensive backups will be able to play well enough for their to be a solid rotation throughout the unit. With the cornerbacks mostly playing man-to-man defense, more than two or three corners will be needed. It is going to be interesting to hear Morris’ assessment of Saturday’s closed scrimmage, and what Morris will and won’t say about the team’s progress.